Oh man I got a bit misty then ...old Stinkleton the Fluffy McSpazzo von Monkey chicken..possibly the smartest dog ever , jeez I miss her.....buried in my back yard at the ripe old age of 16 and a half. She underscored the truth of the line, " as blind as a welder's dog..."
I also miss some of your chooks too. You should post the photo of the one in the driver's seat of the mock tank. For quick pain relief, read preparation rH. Sorry, I've had a bit of a long week. Drove to Brisbane and back the weekend before last and now Melbourne and back on Thursday. Work has been keeping me busy. Anyway I've still be working on some plans. This is just a rough layout of the chassis. Haven't bothered with any of the smaller size bracings, just looking at overall shape of the rollcage/monocoque. Following the rule book, the safest way appears to be welding up a chassis with 42mm mild steel and SIF Bronze no 2. I'm also going to get smart with rebuilding the trailer, will make sure the wheels are the same on the trailer as on the steamliner. Always handy. Oh and sorry about the rough drawing. I'm looking at an upright driving position, 1m from the bottom chassis rails to the top of the roll cage. 3m long and 1.2m wide. Fibreglass body with exposed engine cavity at the rear. Wi'll have to fire up the 3D program and model it properly in the coming weeks. The reason for the exposed engine cavity is in the event of a catastrophic failure, I don't want anything hindering the escape to atmosphere! The engine's still on scraps of paper, but I'll divulge some details. The steam generator will be constructed of refrigeration grade seamless copper tube. Heated via an LPG gas burner, all actuated and automated based on the pressure, temperature and position of the accelerator. Anyhoo more later. If anyone's got some suggestions for chassis design or development I'd love to hear it. Reece , Have you read a rule book yet?? If not you would be advised to.Have you asked anyone ,(race director / steward etc about your idea? ),The idea is great ,but there is no steam class in DLRA ,and it was decided a while ago that no new classes to be added.If you can meet ALL the safety requirements(and I mean ALL,the roll cage must be 1 3/4"- 44.5mm,3.2 mm wall etc),you may be able to run for 'time only',But your vehicle MUST meet ALL safety Requirements!! Gday . Shouldn,t have to create a new class to run steam . Our rule book in section 3.1 says other types of engines that transmit power thru the wheels run in OMEGA ( thats the symbol in the rule book ) engine classification . SCTA at Bonnevile has a steam class . BOB ELLIS wrote: Reece , Have you read a rule book yet?? If not you would be advised to.Have you asked anyone ,(race director / steward etc about your idea? ),The idea is great ,but there is no steam class in DLRA ,and it was decided a while ago that no new classes to be added.If you can meet ALL the safety requirements(and I mean ALL,the roll cage must be 1 3/4"- 44.5mm,3.2 mm wall etc),you may be able to run for 'time only',But your vehicle MUST meet ALL safety Requirements!! Correct me if I'm wrong, but I believe that the minimum requirement for the roll cage is 42mm OD with 3mm wall thickness Mild Steel. I can also run in the Omega engine class as a Lakester or Streamliner. The copy of the rule book I got posted was dated the 10/09/2006. The rules that will need to be looked into is the use of LPG, along with a few other minor bits and pieces. There is no boiler in the design, so there's no issues with the storage of high pressure steam. There's no way you would catch me with a boiler a few inches from my back! Tried to get hold of Brian by email, but his email address no longer exists. I'm really keen to see this machine in action, when are you planning on getting it out on the salt? Early days at the moment, but I'm well underway. I'd be expecting around 3 years from now, depending on finances etc. Either way it's a long term project and I want to do it right. Some bits are easy, the steam generator's coils will take a weekend. The motor I'll be doing some machining, but will probably outsource some of the more critical designs, especially the aluminum sump. Either way, body, chassis, safety and plumbing along with paying for it is what's ultimately going to take the time. Also as far as length goes, I'm quite restricted by the size of the workshop. So I'm looking at low, wider designs. Also engine wise, it's quite tiny as long as i can keep the overall weight down. Yeah, paying for it all can be a tricky business. ReeceJames wrote: Early days at the moment, but I'm well underway. I'd be expecting around 3 years from now, depending on finances etc. Either way it's a long term project and I want to do it right. Some bits are easy, the steam generator's coils will take a weekend. The motor I'll be doing some machining, but will probably outsource some of the more critical designs, especially the aluminum sump. Either way, body, chassis, safety and plumbing along with paying for it is what's ultimately going to take the time. Nice one! I'm not the only crazy steam guy! I started looking at a kart chassis, then realized the control valves would not fit on the chassis. Then moved to a f500 chassis, which I am now aware as not being up to scratch safety wise. (Tube sizes along with me just being too large in all directions) So I'm moving bigger again to a custom chassis and go from there. If your mate needs a hand with the steam side of the kart I'm happy to help. Of interest I'm developing the computerisation on an Arduino board with a custom PCB for thermocouples, 4-20ma control etc. As the boards are cheap and it will me a simple config file to set it up I'm happy to pass on the code when I have more of it tested. My timeline's tentative at this stage. I wouldn't be changing your plans any time soon. When I have a chassis and engine installed, with favorable weather, then we'll see! Thanks Reece, I have directed him to this build thread so he may be here asking questions some time. He is still very much in the conceptual stage, reading as much as he can mostly, he's pretty good with cars and engines in general (mostly old Peugeots, I'm pretty sure he could build one from a heap of scrap metal) but steam is all new to him. I think his goals might be a bit less lofty than yours too, a little kart than he can sit in and drive around the paddock just for the sake of it seems to be the basic aim. Speed or anything else would just be a bonus. Anyway, sounds like you have a great project and I am enjoying following it here and looking forward to hopefully seeing it run. ReeceJames wrote: Nice one! I'm not the only crazy steam guy! Reece, if your workshop is small maybe you should be considering something about the size of a belly tank lakester. The "Belly tank help" thread elsewhere on this forum could be useful for you. And don't forget that good aerodynamics is free speed, you have to have a body of some kind, so you might as well make it slick. 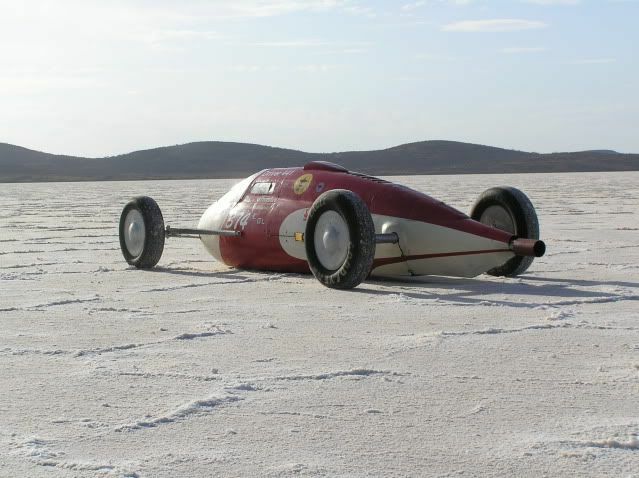 The P38 drop tank dimensions listed there give the tank's overall length at only 12.5 feet, which is no longer than a Formula Ford. Most Formula Fords have a wheelbase around 2.5m and plenty of room behind the firewall for all sorts of mechanical componentry. I'm not suggesting you try to find a P38 tank but it's good to know that cars of that length have a successful salt history. How big is the steam engine and all its ancillaries? How much water will you need for each run? I was also thinking about fire safety, how small can you get the LPG cylinder? A skinny cylinder would fit nicely in the tail of the car and be a long way from you. How fast do you think you can get the car to go? One more thing, I'm not suggesting you use a Formula Ford chassis either, they don't even come close to meeting the DLRA chassis specifications regarding roll cages and such. Scratch built it has to be. David Leikvold wrote: How big is the steam engine and all its ancillaries? How much water will you need for each run? I was also thinking about fire safety, how small can you get the LPG cylinder? A skinny cylinder would fit nicely in the tail of the car and be a long way from you. How fast do you think you can get the car to go? Steam generators consist of coils, the coils will be 300mm diameter and up to 500mm long. 2 coils at this stage, preheater and steam generator. Then there's the lpg burner at one end and exhaust. Made out of copper tube, refrigerant grade, if the worst happens, the copper will just tear open and will not shatter. All you get is a steam leak and no explosion/shrapnel. All the process valves take up the most space, they are what I really need to find room for. Untill I have the valves in my hands, no real idea how much space i'll need. No gearbox, just a really high gearing at this stage, have a number of sprockets to swap out depending. Water wise, little is needed and can be refilled after each run. 10L would be ample in the tank once the engine was running. LPG, 2 BBQ bottles (I don't believe I can but they're about the right size) would do me for a weekend. Fire wise, the bottles will sit behind the driver along with the rest of the engine. Rear engined and a firewall (pending) made out of aluminum fiberglass composite with a layer of ceramic fireproofing. Speed wise, conservative 100mph is what I would love to get to. Theoretically, if the engine and more importantly the steam generator are up to scratch, maybe I'll go faster. Initially I'll be under the 100mph mark. But it is still going to be worth it!